Ernie Nevers is a Hall of Famer in both Pro Football and College Football, a star of the early days of the NFL, and a member of the league’s 50th anniversary and 75th anniversary teams. So, that’s the baseball career of Ernie Nevers, another player who is famous for something else. Not too long ago, I saw a ad for a Sports Illustrated book entitled NFL Quarterback: The Greatest Position In Sports. I immediately recognized this as bull. Oh, maybe being the QB is the most glamorous position in sports, but that’s just one definition of greatest. As far as the greatest importance, quarterback isn’t it. No, rather, a ice hockey goalie is. NFL teams can go far with average or only-slightly-above average QBs. Doug Williams had nearly as many career interceptions as he did touchdowns and never made a Pro Bowl, but he was hot at the right time to help Washington stomp Denver in January of 1988. Trent Dilfer threw more interceptions in his career than touchdowns, but his Ravens won Super Bowl XXXV. The Jets got to within one game of the Super Bowl twice with Mark Sanchez as their quarterback. The Broncos won a playoff game with Tim Tebow at QB. But, look at hockey, and I’m going to guess you’ll have trouble finding a champion who didn’t have a good goalie (and those that didn’t have good goalies that ended up winning probably had that goalie playing the best few weeks of his career). If a goalie is standing on his head, he can turn a mismatch into a even one, turn an underdog into a favorite, and make even the most unlikely of upsets possible (see: Miracle on Ice, Jim Craig, 1980 Olympics, which given his lack of success in the pros may fall into the “greatest few weeks of his life” category). Now, to baseball, as Madison Bumgarner showed us this October, the third most important position in sports is the pitcher. Way back when, when men were men, arms were expendable and relievers were just guys who’d come in if somebody was doing really, really, bad, the pitcher was perhaps just as important as the goalie in hockey. Old Hoss Radbourn infamously singlehandedly pitched the 1884 Providence Grays to the title, throwing 678.2 IP, pitching in 75 of the team’s 112 games and starting 73 of them. His 59 wins that season is a record that will never be broken. In 1904, Jack Chesbro set the modern-era record for wins with 30 for the New York Highlanders, he pitched in 55 of the team’s 151 games, and started 51 of those appearances. Those were the days when “wins” or “losses” meant far more than they do today, since pitchers were all but assured of going the full game, and their opposite numbers were expected to do the same, making the W-L record more analogous to a heavyweight fighter. Since then, the worth of an individual pitcher has gone down. Having one or two or even three or four good pitchers is no guarantee of success like a good goalie or a good QB is. That’s because, well, it’s rare that they are in the game the whole time, and as good as they are they still can’t control their own offense. Just look at how Detroit’s great starting pitching has been constantly foiled in postseasons past by a suspect bullpen, or how Philadelphia’s “Big Four” starters of Halladay, Lee, Hamels and Oswalt failed to even get to a World Series because their team’s offense took a holiday. Still, as Bumgarner showed us this past month, there are still times that a pitcher can make all the difference. If Madison Bumgarner isn’t pitching, it’s likely that the Royals win the World Series. A single player isn’t supposed to decide an entire series. Not anymore. But nobody told Bumgarner that. And he went on to show just how important the position of pitcher is. 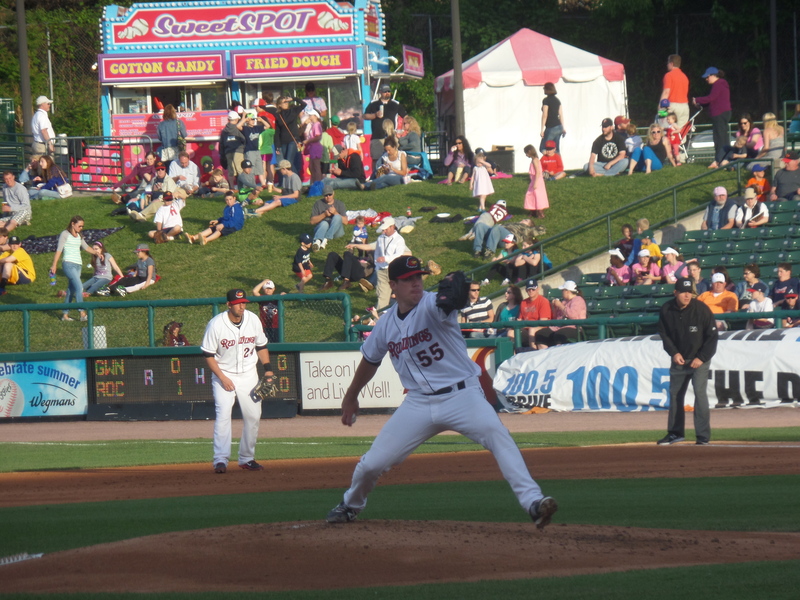 Trevor May deals during a game in May in Rochester. Photo by Dan Glickman. For Minnesota Twins fans, it probably has been a question of “when”, not “if”, and it’s been a question they have been asking since April (probably earlier). Yes, the day has come: Trevor May is going to pitch in the Major Leagues. Having seen May all year this year (I’ve made a point of trying to get to as many of his starts as possible), May was acquired in the Ben Revere trade a few years back. In the past, apparently, he’s had control problems, and they still come up now and then, but in general he’s proven himself more than ready to try in the big leagues, posting a 2.93 ERA (4th best in the IL) and striking out 91 in a little over 95 innings. As I said earlier, he’s generally regarded as the lesser of the two pitching prospects who’ve helmed the Red Wings rotation (Alex Meyer, who has felt streaky at times this year), but he still could be something special, or at the very least be a good part of a rotation, especially one like the Twins’, which needs all the help it can get. Then again, you never know with pitchers. Only time can tell.